This model is no longer in production. Please select from the menu for parts information and technical documents such as advanced specifications, diagrams, manuals and product bulletins. Important Note: Technical information is provided on our website for your reference and convenience. 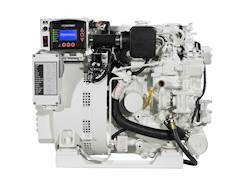 Westerbeke recommends that your engine, generator or climate control system is serviced and/or installed only by an authorized Westerbeke distributor or dealer. Click here to locate the Master Distributor or Dealer for your area. Buy and View Parts Below : Click each image for a larger view and detailed list of the parts for that section. If images do not appear under a "Complete Parts Lists" heading, please scroll down to access the parts related information available for this model.